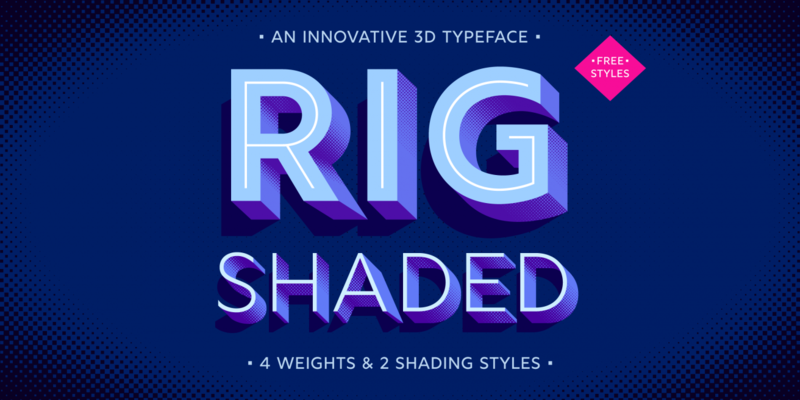 Rig Shaded - A 20 font, four weight, 3D family with multiple shading styles to bring some dimensional 'POP' to your designs. Yeah, bet you didn’t see this font coming. 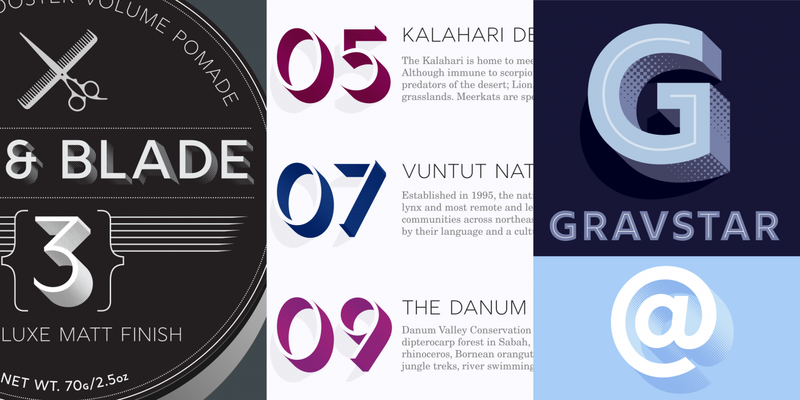 This week we’re talking about a font that takes a unique approach to design, with some truly stunning results. I’ll warn you upfront: this isn’t a font that you can use everywhere. It’s the opposite of a “workhorse” font. But, if you’re looking for a font to add more excitement to your designs, be it contemporary or retro, this might be just what you need. So let’s jump in with one possible use case: making cool titles. If you want to make your design pop out from the screen, 3D fonts are the easiest way to do it. 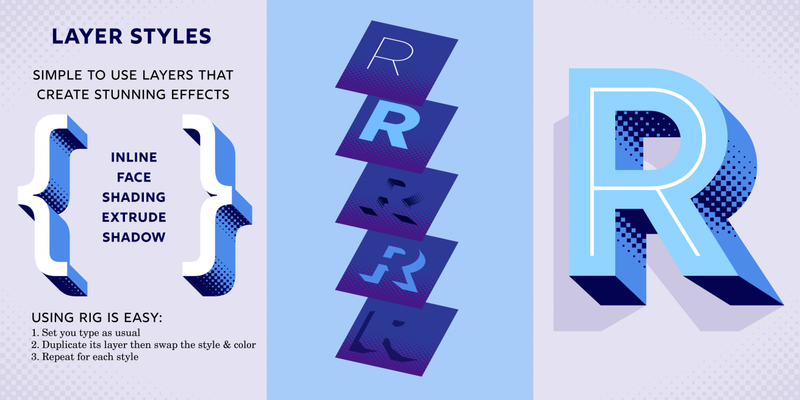 Whether you’re making a contemporary poster for a robotics project, or a retro-inspired title to your latest 80s sci-fi fandom blog, Rig Shaded is a fantastic way to stand out. How does it accomplish this? 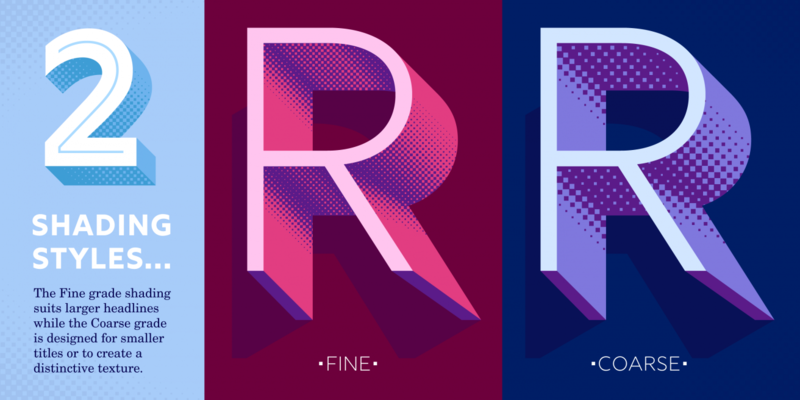 Well, it has multiple layers available for each weight, with halftone and coarse shading as well. This gives you a nice set of options so you’re not limited to one style at a time. Because you’re not restricted by what your design program can do, you’re even free to use other methods to make this look good. That leads into one of the main reasons these layered fonts are so great: they make great web fonts. In fact, we made a whole tutorial on how to do just that: http://blog.fontspring.com/2014/03/layering-webfonts/. You’re not limited to creating images in Photoshop and putting them on your website. 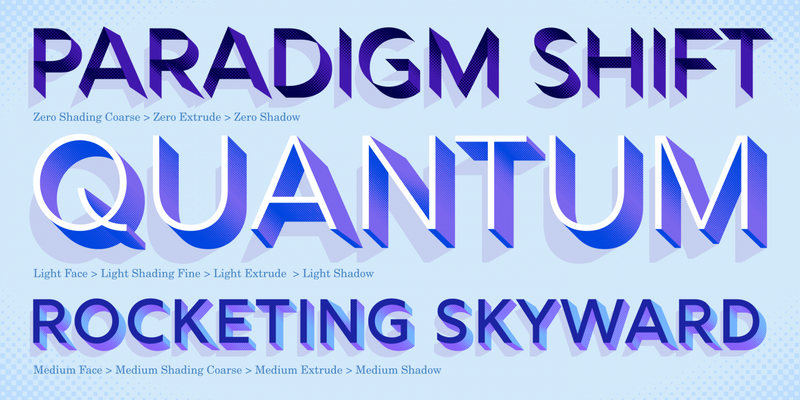 Now you can have dynamic text that has depth and excitement. Finally, know that you don’t have to go all-in to get some use out of this font. We have included many examples that use shaded numbers, or chapter titles to great effect. Everyone knows about using the big monogram letter to start a chapter, but why not try something new and unique? It may be the fresh start your design needs. All in all, Rig Shaded should be one of the first places you look when you feel out of inspiration, and need some pizazz. If you’re not sold yet, there are multiple styles available for free, and the rest are $10 each, so you owe it to yourself to download this font and give it a try.